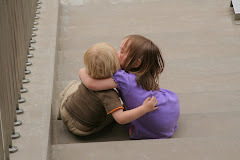 I am grateful for tender hearted boys. Monday Kyle noticed that one of Ben's turtles, died. Ben was devastated. We decided to have a burial and memorial service during our Monday family night. I went off to take the girls and Grant swimming. 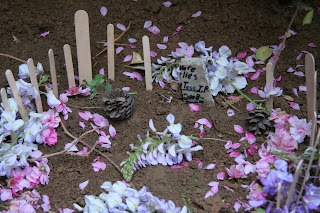 When I returned Ben and Kyle had made a gravesite from popsicle sticks and wysteria petals. Before bed we tried to think of how to have a proper funeral for a turtle. We sat in a circle and each said something nice about her. "She was a quiet turtle." Since Monday I've noticed several monuments throughout the house, including a wire turtle that Ben made. Its sitting on a the rock in the turtle terrerium. He wrote "RIP...Tess the Turtle" on some scotch tape. In Quito we a had a Golden Retriever puppy named Tess who died of distemper. We've decided we will probably not name any more pets Tess. It was funny that in all the chaos of the afternoon, amidst the buzz about Tess's passing, I got a call from the River Garder front desk. She said, in a Chinese accent, "Hello this is Vivian from Customer service. I am calling to confirm that you have lost a white rabbit. Please go to #1119 to find it." She sounded quite disappointed when I told her that we didn't own a white rabbit, although I had considered getting one at Easter time. We do have a lot of children, a couple of cats, a tank of fish, a dog that goes AWOL from time to time, and one surviving turtle, but we're not responsible for all the little creatures wandering around the compound. I was worried that the other turtle would be depressed now. Rob didn't think so. Grant has gotten into the habbit of asking me to show him the turtle several times a day. He says "I turtuh." We promised Ben that we'd get a new turtle Saturday. I'll be sure to include his picture when he or she arrives. That's too bad for Ben. I am impressed that the turtle lived this long. Maybe 1 year is like 100 in turtle years.. I don't know. It was a cute quiet turtle though. Good luck finding a new one.